Is this really serious??? Namotel Achhe Din (Means: Namotel Good days) is new smartphone costing only Rs. 99. Really? As per the reports one need to book it online on namotel.com. And even before doing to the official site one need to register in a site called bemybanker.com by providing some details like aadhar and such details. The the customer would be an username and password so that he can login on Nomatel Achee Din Site. But both the sites are not working!!? Tech issue or server crashed due to heavy booking traffic..??? ?As per news user need to pay a lifetime membership fee of Rs.199 to get register and this facility is available between 17th may and 25th May 2016. 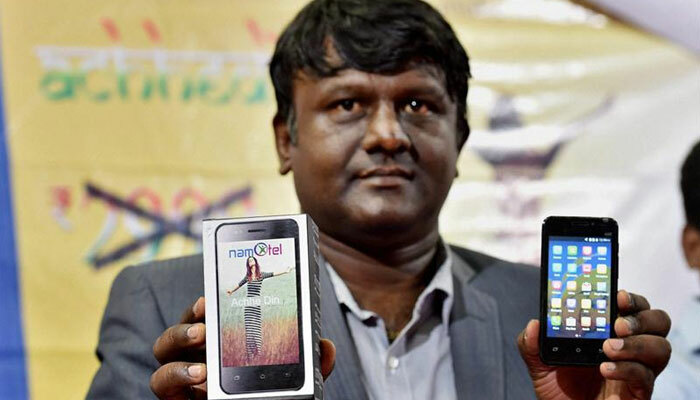 Anyways Bangaluru based promoter of the company Madhava Reddy launched this world’s cheapest phone which unbelievably costs only Rs.99 during a press conference on Tuesday. This phone originally costs 2,999 but the introductory price is Rs.99. The payment can be done on cash on delivery process with a nominal delivery charges. As per reports the specification of the Namotel Acche Din, the smartphones features a 4-inch display and runs on Android 5.1 Lollipop, powered by 1.3GHz quadcore processor along with 1 GB RAM and supports dual SIM, a 4GB internal storage, 3G connectivity, 2MP rear and a VGA front camera. It has a 1325 mAh battery. We have to wait some more to know about the user experience of the world’s cheapest smart phone and whether it will create a market for itself or just get controversial like Freedom251 and disappear altogether.